Writing is a funny business – you are constantly making things up in your head, and not always sure where on earth any of it came from. 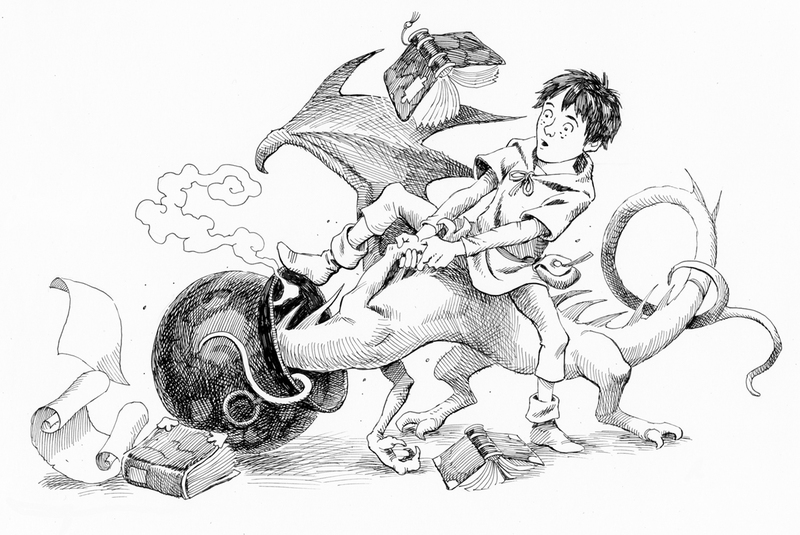 But one of the things I find most mysterious about writing is how the people in your stories develop into real characters – like Max Pendragon and Adolphus the dragon, from the Spell series, pictured here in an illustration by David Wyatt. One of the reasons I find it mysterious, I think, is that I don’t really plan for it. With plot, I know that I have to have some idea of what’s going to happen – I’m not one of these writers who can just let imagination take hold and write. I have to know vaguely where I am going and have some idea of what’s going to happen next. But with characters – I have no idea, really, who they are when I start. I have names, and ages, and some sort of idea of where they fit into the plot. I know if they are basically helpful or if they are the ‘baddie’. But beyond that – nothing. I have no elaborate character cards, lists of traits, back story, foibles, weaknesses, strengths – all these come out of the story as it goes along. 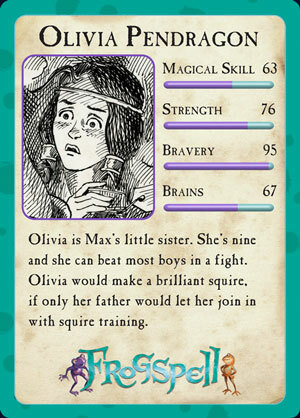 But the really funny thing is, that a lot of the time I’m no wiser about my characters when I’ve finished! I mean, I know them really well – I’d recognise them if they walked down the street, I know what they’d say or do in any given situation. But describing their character traits? Explaining their weaknesses or strengths? Dissecting what sort of person they are? Nope. Can’t do it. 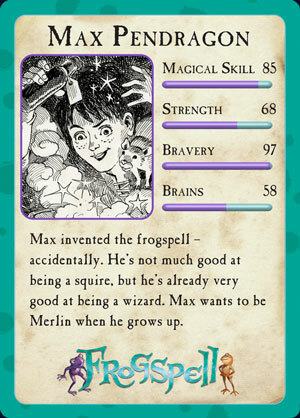 My publishers made a whole set of Trump cards for my characters in the Spell series (you can find the others here). They’re great – but I’m glad it was up to them to decided what went on each one, because I’m not sure I’d have been very good at it. 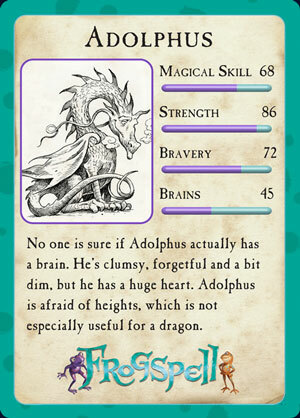 People say that they like Max because he’s brave, or determined, and that Adolphus is their favourite character because he’s so clumsy and dim-witted but enthusiastic – and I think, you know what? You’re right – they are like that! And I feel really pleased that they came out as strong characters. But I never plan it that way, or have the least idea as I’m going along that that’s what I’m doing. I think I must just be really bad at ‘seeing’ those aspects of character – I’ve always found it difficult. I can’t even describe myself, never have been able to. The only way I have any idea of what sort of person I am is because people tell me the same things about myself lots of times and eventually I accept that they must be true. As far as I’m concerned, though, I’m just this invisible/neutral person watching everyone else, with no characters traits at all! 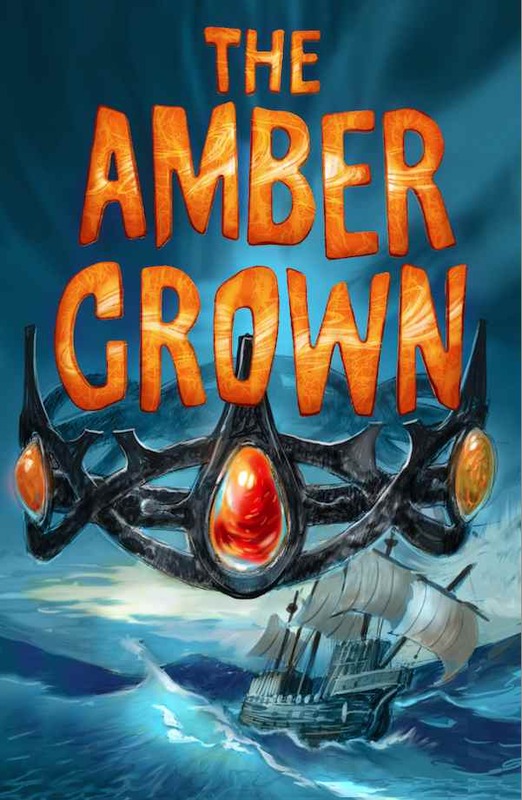 It just goes to show, I guess, that so long as you can picture your character strongly enough, put yourself in their shoes, know what they would do and say, feel who they are, you don’t need to be able to dissect them and name all their traits. I hope not, anyway! Tags: characters, writing, writing techniques. Bookmark the permalink. Funnily enough, was talking about this with another writer recently. She had been shown a creative writing guide for new writers, recommending writing down long lists of characteristics, hobbies etc for every character and felt this was just not how character-creating works. I agree with both of you. I “know” my characters, but not in an “itemised” way. Characters need not be lists!